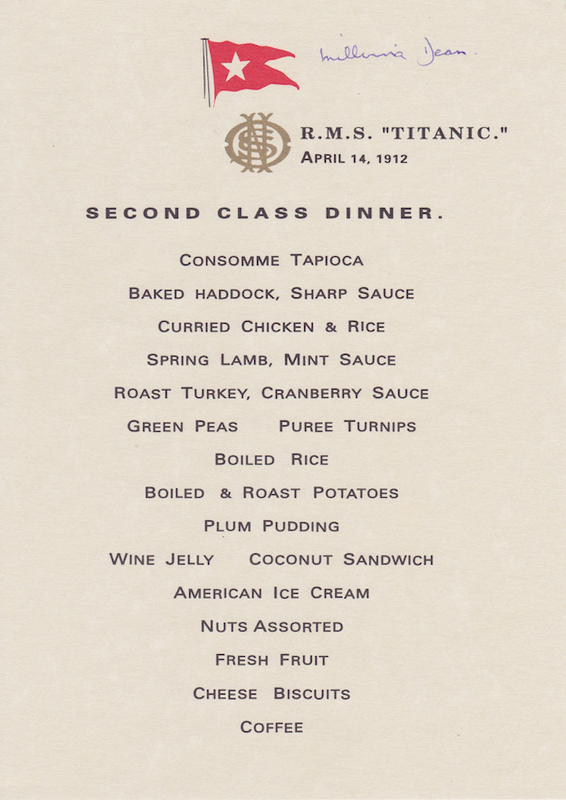 Titanic Second Class Menu Signed by Millvina Dean Signed by the last remaining Titanic survivor from 15th April 1912. This is a good quality reproduction menu from the last evening meal on 14th April 1912. Signed by the last remaining Titanic survivor from 15th April 1912. This is a good quality reproduction menu from the last evening meal on 14th April 1912. Elizabeth Gladys Millvina Dean (2 February 1912 – 31 May 2009) was the youngest passenger aboard the Titantic and the last remaining survivor from the disaster which occurred on the 15th April 1912.